We’re up to week 4 in our legacy league. I guess this shouldn’t be surprising, but there’s still tons of awesome options to play with. Chief among them, Patch is still legal! Let’s change that, shall we? The Team: Nick Fury goes on a membership drive. 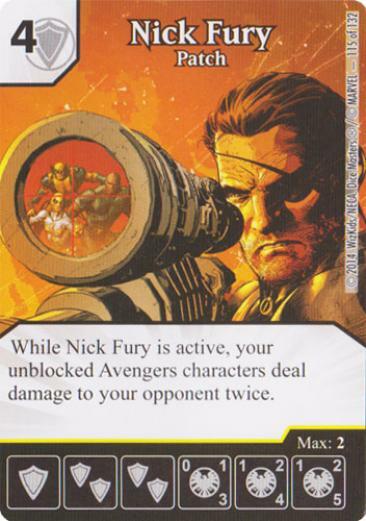 The two cards being built around here are Nick Fury: Patch (not to be confused with Wolverine: Patch) and Avengers ID Card. The combo is pretty easy: field Patch, attack with stuff, use the ID Card’s global to make them Avengers, deal double damage. The fun thing is, nothing else in my team has to be an Avenger: all I need is to use the global with Patch active. There’s lots of broken things to be done with this. For this specific build, I’ve gone with the common Yuan-ti; it’s just a logical fit. 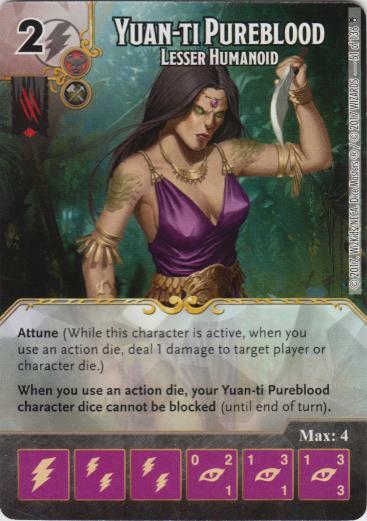 Make her an Avenger, use the ID Card global, then use the ID Card itself; Yuan-ti, now an Avenger, gets buffed, triggers her Attune, and then she’s unblockable and will deal 8 to 10 damage per Yuan-ti due to Patch. It’s easy to underestimate. As for the rest of the team, Storm is there for extra removal (a last-ditch strategy can be: swing with everything, hope Storm rerolls stuff off the board, and make whatever’s unblocked an Avenger). Scarlet Witch is there to deal with action-based teams (in case I run into Attune + Thrown Brick, which did end up happening), and Chalkboard is there for ramp and to set up a winning turn (e.g. if I have Patch + 2 Yuan-tis, I might use it to Prep an ID Card). As for Wasp, it wasn’t supposed to be there (see below), but I put her in for her while active effect, as that damage seriously puts the game on a clock (and it’s great Shriek bait). Insect Plague served no use in this build; I was going to use a funny secondary strategy: use Larfleeze and Insect Plague. 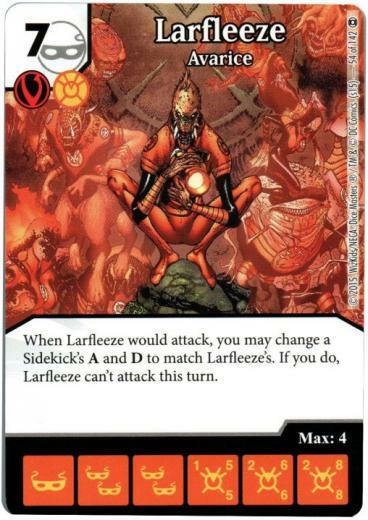 Make a sidekick unblockable, give it Larfleeze’s A and D, make it an Avenger, then deal double damage with Patch. Potentially 16 damage with one character. …That was the plan, anyhow. Unfortunately, though, I took the wrong dice out of my box and thus couldn’t play with Larfleeze. I borrowed a rare Wasp from another player to take its spot. Sniff, rest in peace, funny combo. I’ll have to try it for real some other time. I started the evening against Fixit + Immortals. I knew I had to rush for the win condition. She did the same, and Fixit hit the field quickly. Since she has PXG, I managed to set up really quickly as well. At one point, she did a big swing with a Hela, but left herself open enough for me to hit back. She was at 19, and I did 18 damage by making everything into an Avenger, using ID Card, and charging in (yes, seriously). She almost got enough to win the next turn, but she was short one bolt energy to get the last point of damage in. I won by using the Wasp global the next turn. And now, time for SR Ultraman + Boom Boom. I bought Scarlet Witch early, and she made my opponent’s life a lot harder. He then went for his Ronin (nostalgia!) to try to stop my damage. At one point, he had Ronin and a sidekick, and I had Patch, Storm, and Yuan-ti, with my opponent at 17 life. 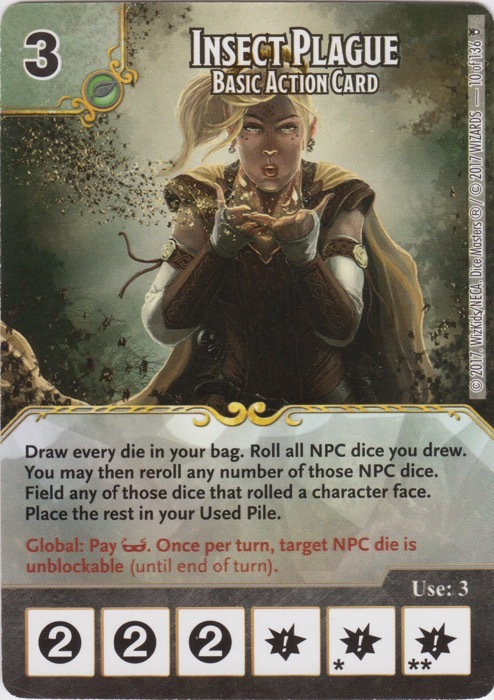 I rolled an ID Card, made Storm and Yuan-ti into Avengers, used the ID Card and used Attune on my opponent (now at 16 life). I then attacked with Storm and Yuan-ti, rerolling his characters due to Storm. He would’ve used Ronin to stop one character’s damage…but his Ronin rolled energy, as did the sidekick, and I did 16 damage (YT and Storm both at 4A due to the ID Card buff, and both having damage doubled), dealing him exactly lethal damage. We were both shocked at how suddenly I won. The damage output’s insane. Next up, time to face Boom Boom + Morph + Attune Wasp. Seriously, if he’d had a bit more luck, this would’ve been banned weeks ago. Scarlet Witch was the key piece for me here again. With no Thrown Bricks rolling, he had to rely on Morph to damage me. While he had Shriek, he had to use it on Patch to survive and hope he could win the long game. While it was the correct move, it didn’t work; I just kept setting up Yuan-tis and ID Cards in the hopes that I could ping Shriek off with Attune and swing in with the combo. Eventually, I managed to outpace him and win. He’ll be glad that the Witch will be banned next week, for sure. For this one, I ended up against the bolt burn team from last week. He would rely on Firefly for burn…but Firefly did not roll at all, which destroyed his strategy. He did get Meteorite out to try to limit my attacks. The issue for him was that I only needed 2 Yuan-tis, with Patch active, and one ID Card to deal 20 damage. 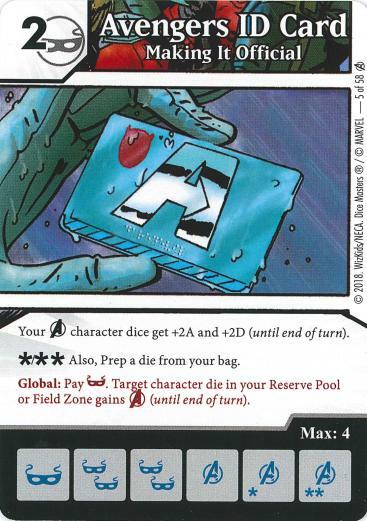 In fact, I rolled 2 ID Cards with these guys active, alongside 2 masks, dealing 28 damage with 2 unblockable Yuan-tis. I won. Yes, we actually played 5 games tonight (rounds were pretty quick). My last game of the night was against the Thor Hulk + Babs + Immortals team. We both raced for our win conditions, as either of us could’ve won that way. He did a detour to get a Shriek so Patch would be blanked though. Babs and Hulk both hit the field, but it was a bit too late: I’d been wearing him down with Yuan-ti attacks (even without Patch, she can still hurt when buffed by the ID Card), and before my opponent could do damage (he had Daisy Johnson on the board, ready to attack the following turn) and completely wreck me, I got Yuan-ti on the board + 2 ID Cards and swung in for just enough damage for the win. One more turn, and I would’ve likely lost, but as it is, I won. Phew. -To reiterate, all you need for lethal damage: 1 Patch, 2 Yuan-tis, 1 ID Card, 2 masks. If any of your Yuan-tis is level 1, you need 1 bolt to compensate. This is very easy to set up, and can win out of nowhere. -This may not be news, but Patch + ID Card is an extremely versatile combo. If you don’t like C Yuan-ti, use it with, I dunno, the 2-cost Wong, make it an Avenger, unblockable with Insect Plague, and that’s 4 to 8 damage per Wong. Or use it with Guy Gardner or Dum Dum Dugan, and deal disgusting damage when they’re not blocked. There’s a lot of potential here for sure for a crazy Golden Age or Global Escalation team. -One problem I had is that I’d occasionally have a hard time getting bolts or shields, which sometimes delayed me for a turn or two. I maybe should’ve used the FUS Ring to get the energy type I needed. It would perhaps have helped make the team more reliable. Overall, it was great to discover this combo, but I think the rest of the players wanted to take a flamethrower to the team by the time the evening was done. I guess it’s a good thing it’s banned.